Charity Miller scores one of her four 3-pointers of the night against Springboro to end up as Wayne’s leading scorer with 13 points. Olivia Trice drives past Springboro defender Maddy Bakosh. Destiny Bohanon races by Jordan Hobbs to set up a score during the first half. Jaida Wolfork defends as Springboro’s Rachel Gillum looks to make a pass. 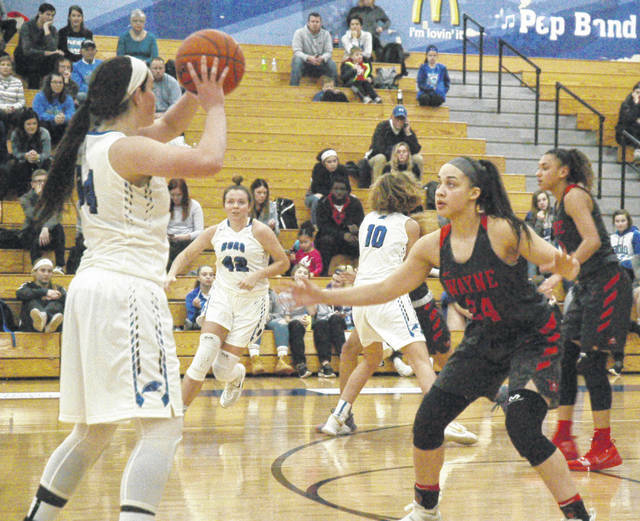 SPRINGBORO — Senior guard Charity Miller buried a 3-pointer in all four quarters and tossed in a free throw to score a team-high 13 points Wednesday night to help lead Wayne to a lopsided 60-33 victory over Springboro. Leading 6-4 the Lady Warriors went on an 11-0 run on two baskets inside by Aubryanna Hall, one by Destiny Bohanon, a trey by Miller and another basket by Nyla Hampton to take a 17-6 lead. 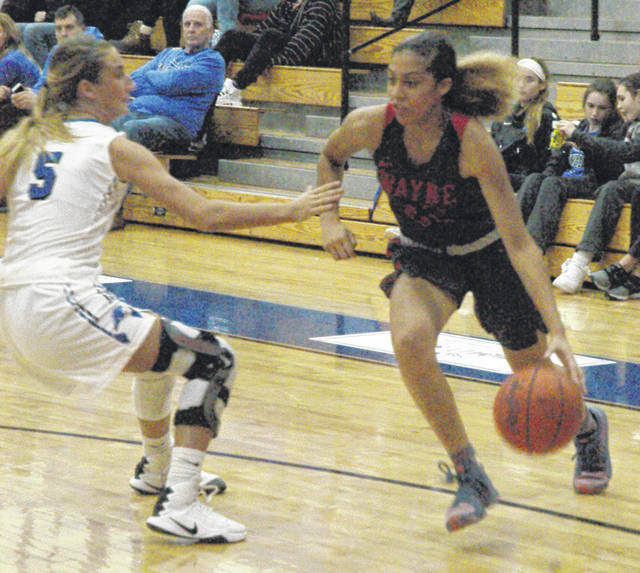 Hampton and Olivia Trice both drained 3-pointers early in the second quarter, Kyra Willis scored inside, Jaida Wolfork tossed in a free throw and Miller buried her second triple of the night to boost Wayne’s lead to 28-15 with 3:12 left in the first half. 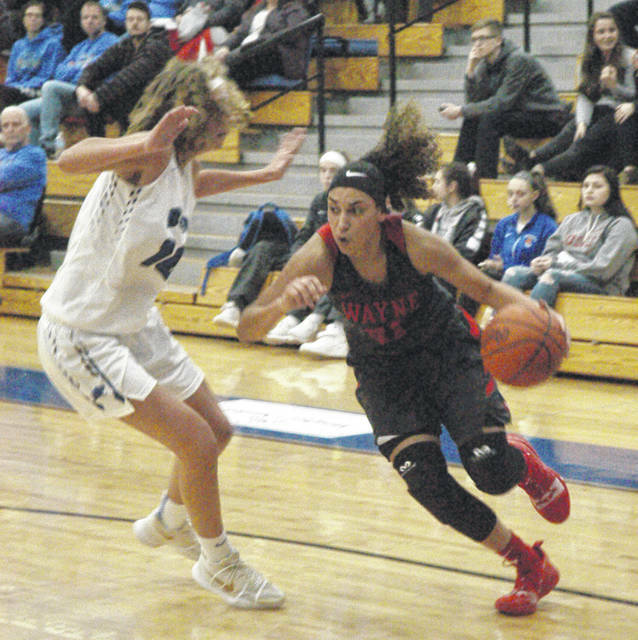 In the third quarter Wayne picked up where it left off going on a 12-0 run capped by Miller’s third triple of the night to open up a 45-21 lead with 3:32 left in the third period to effectively put the game out of reach. The quarter ended with the Lady Warriors holding a comfortable 49-23 advantage. 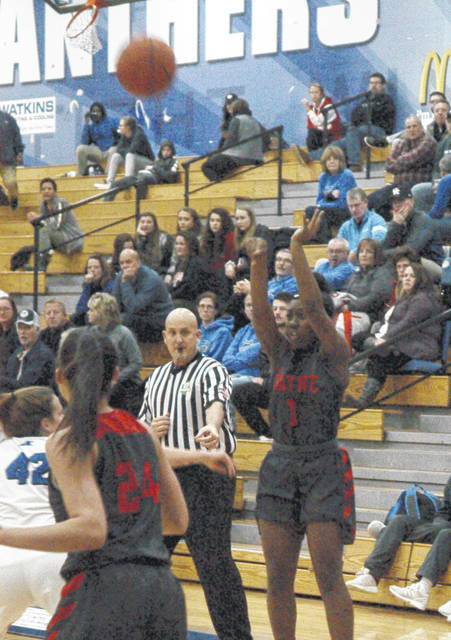 In the fourth quarter junior forward Jaida Wolfork rang up a 3-pointer and Miller nailed her fourth trey of the game to put Wayne up 55-25 with just over five minutes remaining. Wayne did a good job of sharing the ball passing to open players and capitalizing on most of its scoring chances. Sunday and Monday the Lady Warriors will compete in the Berlin High School ‘Classic in the Country’ facing Canton Glen Oak in Sunday’s game (1:40 p.m.) and Pickering ton Central on Monday at 1:20 p.m. The team returns home to host Lebanon on Wednesday (7:30 p.m.) and plays at Fairmont on Saturday, Jan. 26 also at 7:30 p.m.
Wayne: Charity Miller 4-1-13, Nyla Hampton 3-2-9, Kyra Willis 1-0-2, Destiny Bohanon 4-1-9, Olivia Trice 5-0-12, Aubryanna Hall 4-2-10, Jaida Wolfork 2-0-5. Totals: 23-6-60. Springboro: Haley Crozier 1-0-3, Jordan Hobbs 2-1-5, Olivia Majors 2-0-5, Peyton Nation 2-3-7, Isabella Cassoni 0-2-2, McKel Nation 1-0-2, Rachel Gillum 1-1-3, Emily Matthews 1-2-4, Karlie Winship 1-0-2. Totals: 11-9-33. 3-point goals: Wayne 8 (Miller 4, Trice 2, Hampton, Wolfork); Springboro 2 (Crozier, Majors). Records: Wayne 9-4 (5-2), Springboro 7-8 (2-5).